Approximately 2,000, primarily new students and their families, attended the event, which was held in the college’s Richard and Helen DeVos Fieldhouse. 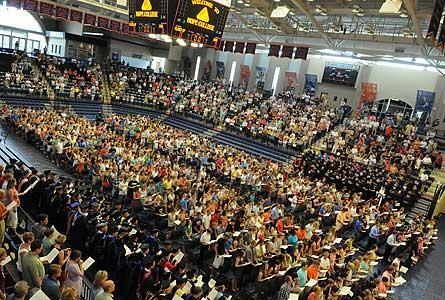 The college has registered more than 900 freshmen this fall, topping last year’s record of 848. The new students moved in on Friday, and returning students began moving in on Sunday. Fall semester classes start on Tuesday. The students, vanOyen-Witvliet noted, are joining a community whose dedication to fostering their discernment extends campus-wide. A key step in the process, vanOyen-Witvliet said, is for the students to think in terms of calling: to discern where needs, faithfulness, talents, and interests intersect. “Frederick Buechner (in ‘Wishful Thinking: A Theological ABC’) says that ‘The kind of work God usually calls you to is the kind of work (a) that you need most to do and (b) that the world most needs to have done…The place God calls you to is the place where your deep gladness and the world’s deep hunger meet,’” vanOyen-Witvliet said. Hope, she noted, would provide numerous opportunities for students to explore how the pieces might fit for them, and even, perhaps, to be surprised by the result. With the opening of the football season a week away, Hope fans had an opportunity to experience the annual pre-season scrimmage at a revamped Holland Municipal Stadium.